South West Rocks is midway between Sydney and Brisbane on the beautiful mid- north coast of NSW. The abundance and diversity of marine life found around the islands plus regular twice yearly sightings of humpback whales, is due to South West Rocks being one of the closest points on the coast to the continental shelf, providing warm, clear water from the southward flowing East Australian current, as we as cooler currents from the south. The results is a fascinating combination of marine life. Fish Rock: Probably the best known island of South West Rocks. Names for the sheer numbers and variety of fish found around the rock. Fish Rock also boasts some spectacular seascapes including sheer walls and hidden caves harbouring magnificent growth, giant Queensland gropers, giant cods, schools of pelagic's and cruising whalers. Large numbers of grey nurse sharks can be sighted here between April and November. 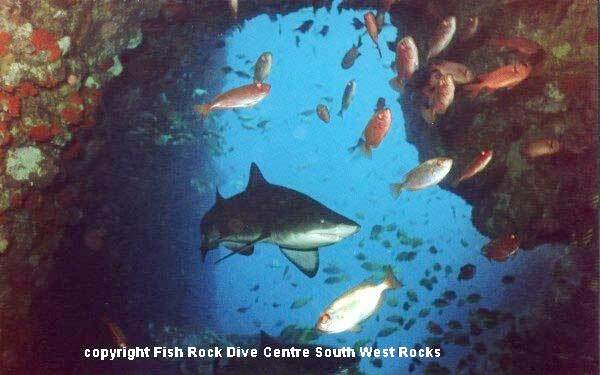 The most famous site is 'Fish Rock Cave', one of the largest ocean caverns in the southern hemisphere; 120metres right through the island. Anemone, anemone fish, giant cuttle fish, turtles, banded coral shrimp, blue grouper, hundreds of painted crayfish, slipper cray's, butterflyfish, anglefish, black cod, live cowry shells, large lionfish, nudibranchs, moray eels, zooanthids, large black coral trees... a diver's paradise!